Listening to this now, first spin. No comment on the music yet, but, man, Wergo discs are spendy. Looking forward to the Freeman Etudes, long on my list of Cage pieces to hear. Thanks for the recommendation, one of the best Concert performances I've heard (not a terribly large field, unfortunately). 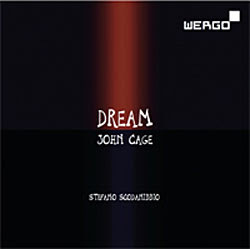 Dream is indeed lovely, one of the two pieces Cage wrote in this style (the other is In A Landscape). There's a version of Dream by Karen Phillips for viola with viola ensemble that I'd like to hear one day. Great Ryoanji too.